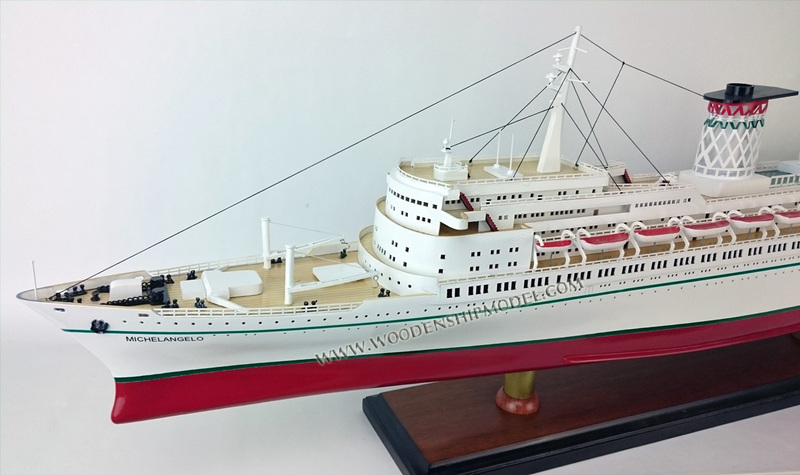 SS Michelangelo was an Italian ocean liner built in 1965 for Italian Line by Ansaldo Shipyards, Genoa. She was one of the last ships to be built primarily for liner service across the North Atlantic. Her sister ship was the SS Raffaello. The Italian Line had begun planning new ships in 1958. 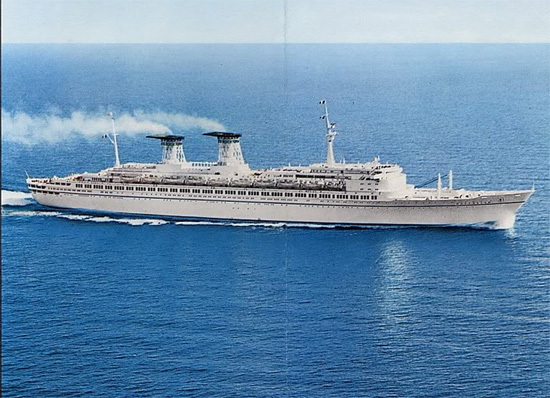 Originally they were to be only slightly larger than SS Leonardo da Vinci, which was still being built, but the jet aircraft had not had a notable effect on the Mediterranean area at the time and a pair of genuine superliners seemed like an attractive idea, not only from a commercial point of view but also from the point of view of providing jobs to sailors and shipyard workers. Hence it was decided that the new ships would be the largest to be built in Italy since the SS Rex in 1932. It was decided that the ships would be true liners, their accommodations divided into three classes. For some reason it was also decided that the three bottom-most passenger decks would not have any portholes. It has been claimed that this made the ship's sleek hull shape, but that seems unlikely to be true as ships of similar length/width ratio have been built with windows along the entire hull. Whatever the shortcomings in their initial design, though, the new sisters were very advanced on the technological side. The most striking feature in the ships were their Turin polytechnic-designed funnels, which consisted of an intricate trellis-like pipework (instead of the traditional even surface) to allow wind to pass through the funnel, and a large smoke deflector fin on the top. Although much criticised, the funnel design proved to be highly effective in keeping smoke off the rear decks. The smoke deflectors became popular in ship design during the 1970s and 1980s, whereas the idea of allowing wind to pass though the funnel was picked up again in the late 1980s and is almost the norm in modern shipbuilding. 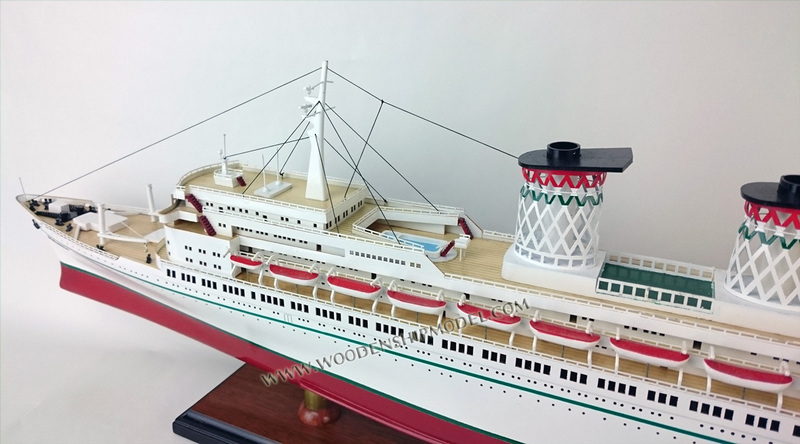 The Michelangelo's interiors were designed by naval architects Nino Zoncada, Vincenzo Monaco and Amedeo Luccichenti, who gave the ship a less adventurous, more traditional look than the designers of her sister Raffaello. After several delays the Michelangelo, under command of Senior Captain Mario Crepaz, was finally ready for service in May 1965. During the sea trials some vibrations were detected on the stern of the ship. Michelangelo was drydocked in December 1965 and received new propellers and some modifications to her transmission. She clocked 31.59 knots during her post-refit trials, making her the fifth-fastest passenger ship in the world at the time. In April 1966 Michelangelo, under command of Senior Captain Giuseppe Soletti, was hit by an unusually large wave during a storm in the mid-Atlantic, which caused the forward part of her superstructure to collapse, or to be pushed backwards, and swept two passengers into the sea. One crew member died a few hours later and over 50 people were injured. When repairs were carried out after the accident, the aluminum plating in the superstructure was replaced by steel plates. 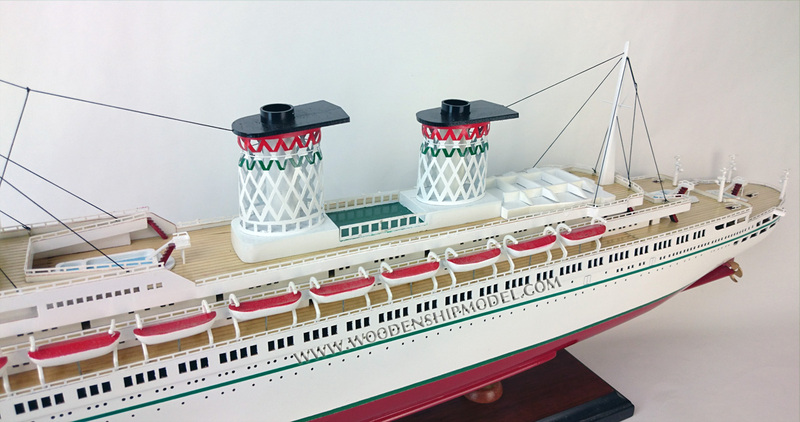 Similar reconstruction was carried out on the Raffaello and other contemporary ships such as SS United States and SS France. In May 1972, Alfred Hitchcock took a voyage on this ship from New York to his screening of Frenzy at the Cannes Film Festival. During the following years passenger numbers in the Transatlantic trade declined steadily due to competition from the air, and more and more ships were withdrawn. 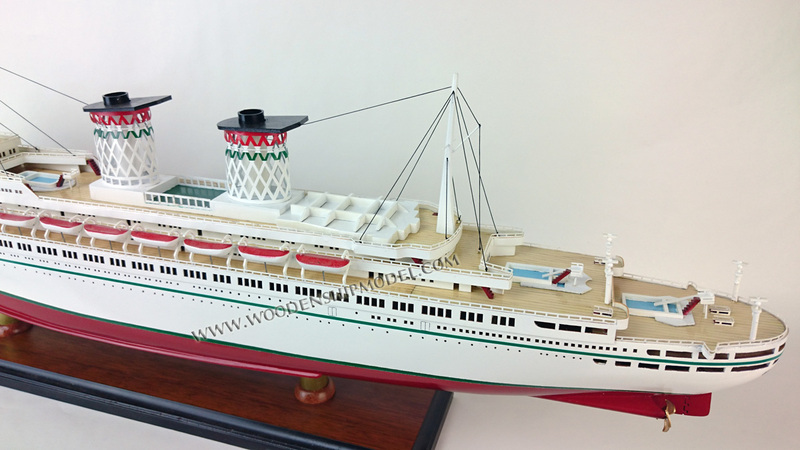 The Michelangelo spent more time cruising to warmer waters, but she made a poor cruise ship with her windowless cabins and three-class layout. She had large lido decks that were superior to even most purpose-built cruise ships of the time, but that was not enough to compensate for the ship's shortcomings, and Italian Line did not have enough funds to rebuild the ship to make her a more usable cruiser. Additionally, she was considered to be too large to be a cruise ship by that time's standards. Italy's flagship SS Michelangelo made her last Atlantic crossing in July 1975, under command of Senior Captain Claudio Cosulich. Afterwards she was laid up at La Spezia alongside her sister. Several buyers (including Knut Kloster of Norwegian Cruise Line) inspected the ships but did not wish to buy them due to the costs required to modernise them to cruise ship standard. There was one serious buyer, Home Lines, who wished to buy the ships and keep them under Italian flag for cruising in the Caribbean. The Italian Line refused to sell the sisters, reportedly because they felt keeping the Italian flag would have associated the "embarrassing money-losers" with them. In 1976 a buyer was found that agreed to the terms sought by Italian Line. The Shah of Iran purchased the ships, to be used as floating barracks. The ships that had cost $45 million each were now sold at the price of $2 million per ship. The Michelangelo ended up in Bandar Abbas where she was to spend the next fifteen years. In 1978 plans were made to reconstruct her as the luxury cruise ship Scià Reza il Grande (in honour of Rezā Shāh). However, an expert team sent from Italy to inspect the ship came to the conclusion she was too badly deteriorated to make rebuilding a viable option. Similar plans were made again in 1983, but they too fell short. Finally, in June 1991, an end was put to the Michelangelo's suffering when she was scrapped in Pakistan.